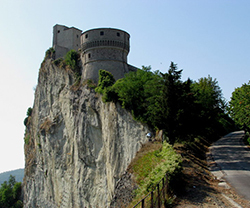 The hinterland of rimini, and, more in general, the romagna, offers many possibilities. Here you will find treasures of history, culture, art, nature and gastronomy. In a context to the fairy-tale dotted with medieval castles, enchanting villages and unspoilt woodland, it will be nice to taste the typical delicacies, such as wine, oil, the famous piadina bread and cheese from the great character, like that of the pit. For those who love nature and hiking, the region is also the area of natural parks where there are paths and routes to be discovered between the flora and fauna of the area. 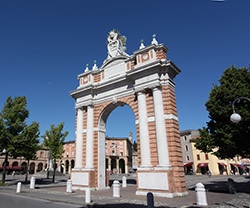 Known for its culture, its art and its history but also for being the birthplace of several artists and intellectuals, Santarcangelo di Romagna is a concentrate of traditions and history. Squares, streets, corners of the country and the historic district recall his past kept alive by the various fairs that are held throughout the year. Thanks to its restaurants and taverns it is a perfect meeting point for an evening in the company and to taste the typical specialties of the territory. The city-state independent from the long past, is situated at 750 metres altitude , on Mount Titano, and from its summit you can enjoy a breathtaking view of the valley and of the sea. It is the perfect combination of history, with many museums, churches and palaces to visit, and modernity with its outlets and shopping centers. 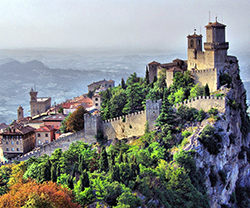 A village located on a spur of rock in the marecchia valley, the first thing that strikes you is definitely theimposing Fort that overlooks the town, while the second is the breathtaking view from the valley of Marecchia to the sea. Also famous from the point of view of the historical, cultural, hosted Dante and Cagliostro , and was the capital of the kingdom of italy. 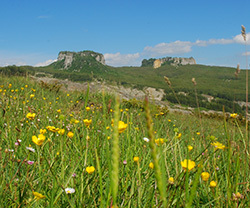 Included in the ancient territory of Montefeltro, parco Sasso Simone and Simoncello is located 40 km from the coast romagnola. The classic landscape of the hilly-mountainous is composed of several peaks: the highest is the Monte Carpegna of 1.415 meters. Inside the park you can meet wild animals such as roe deer, wild boars, badgers and foxes, and especially the wolf, the real protagonist of the park. 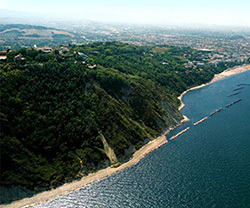 16 thousand hectares of land that stretch from the port of Pesaro and Gabicce Mare, for a breathtaking view of the sea from the mediterranean appearance and unforgettable fragrance. The San Bartolo Park is formed by spurs and valleys, punctuated by sheer cliffs, and narrow and features beaches of gravel and pebbles. Ideal for walks in the countryside and days on the beach different from the usual.